We want to tell you about a cool little project we've been working on for the last few months, and while we weren't under NDA for this one we still couldnt talk about it - this time in case CIG found out. 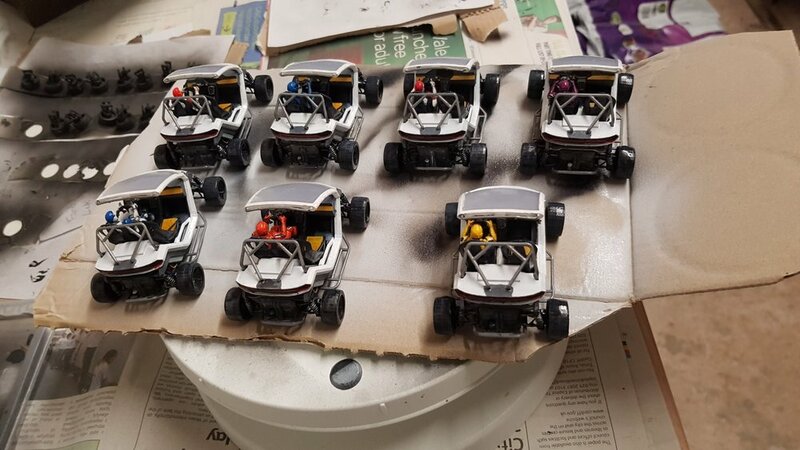 Inspired by the dioramas on the Kraken model at CitizenCon (and our desire to do something cool for the guys who work tirelessly behind the scenes at CIG) we started planning an awesome Christmas present for them. 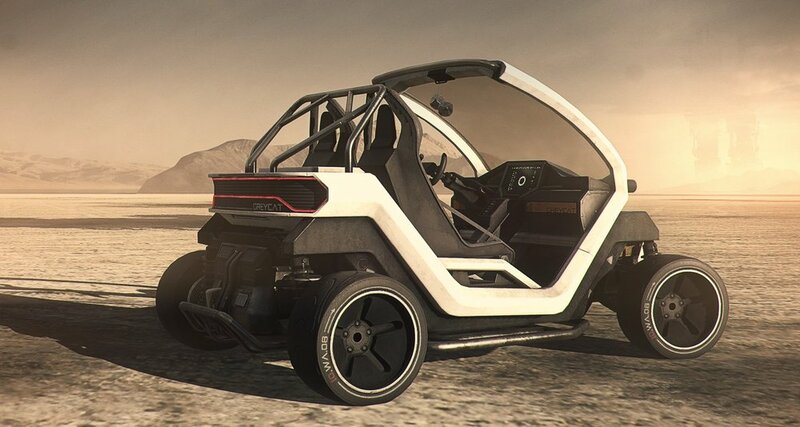 The Greycat has a special place in the hearts of those of us who have been fans and backers since the early days. So JR set about taking apart the greycat model to reprint. We’d learned a lot from the Kraken and had a lot of failed prints due to the complexity of the model so decided to go a wee bit bigger, settling on 1:40 scale. We wrote our list and checked it twice, as we tried to work out who'd been naughty or nice. Eventually we agreed on 18 deserving peeps (it didnt sound that much back then) but thats 36 chairs and 72 wheels - not accounting for spares. Did you know that each wheel has brake discs and springs? And they're different on each wheel? The beautiful complexity of StarCitizen. 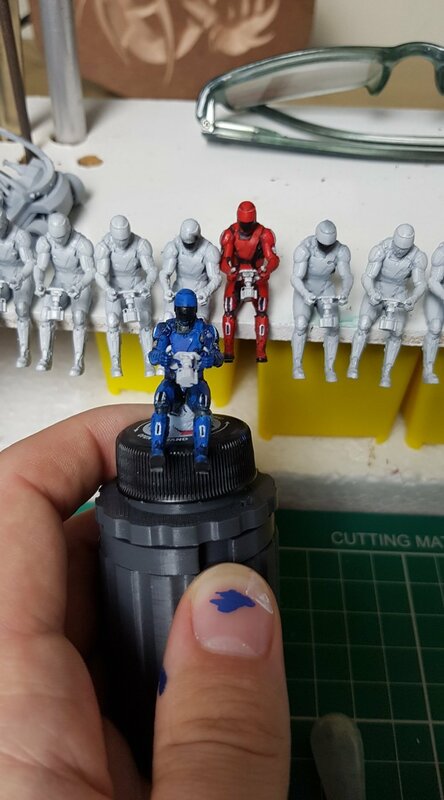 Once we're into production, we're into Kals' territory, so after some test prints and minor alterations it was time to print the models. 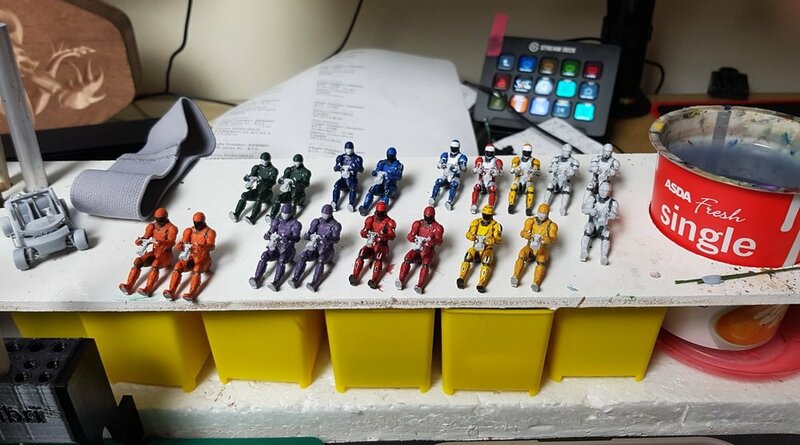 170hours later, the component pieces were printed. Then it’s onto post-processing - washing in IPA (no not beer) and curing under UV light, before Kals could remove the scaffolding and supports and carefully package them up. Off they went in the post to Wales for Tim (aka @Myzrable_G) to work his magic on their paint jobs. He rose to the challenge as we knew he would - even though some of the pieces were so light the airbrush blew them all over the place. 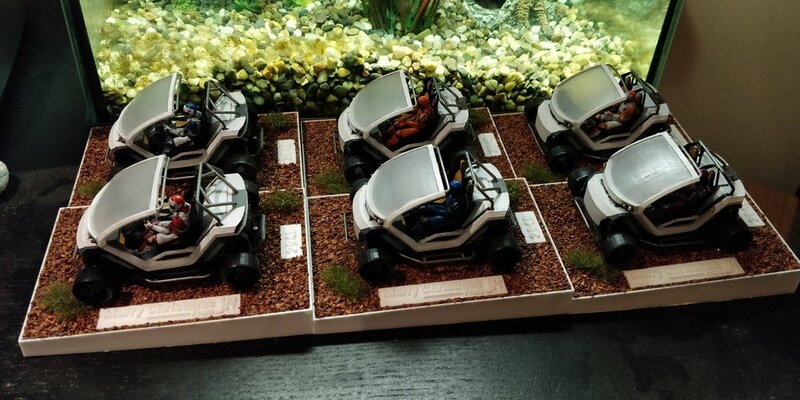 Each Greycat was accurate to the in-game model but Myz was able to devise different paint schemes for the drivers, so that no office has two drivers in the same colour scheme. Myz then had the challenge of putting the models together for their final lacquer coat before sending back to us in Scotland. The next stage was the plinths for the GreyCat to sit on. Adam (aka @TheMoistNoodle, the newest member of this crazy team) was in charge of the "environment". After some experiments with different materials we settled on a gravel deck with grasses to complete the model. 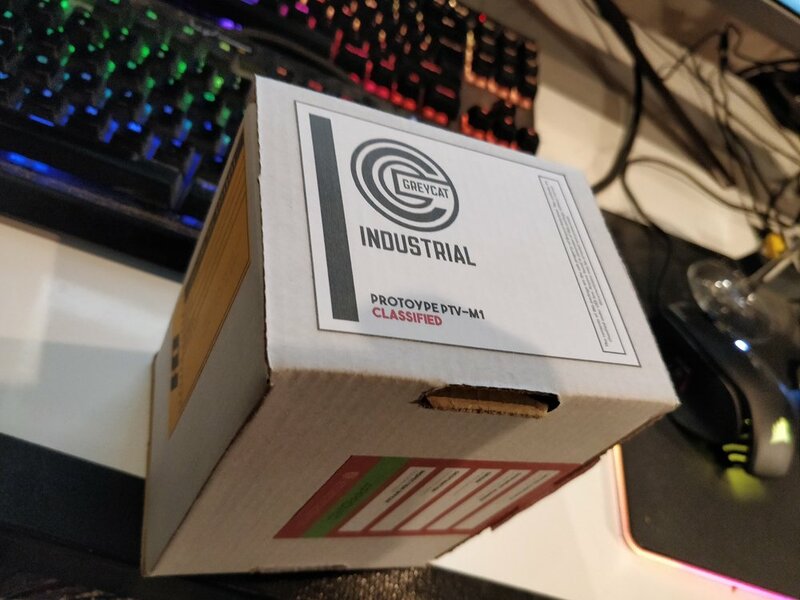 Finally packaging. 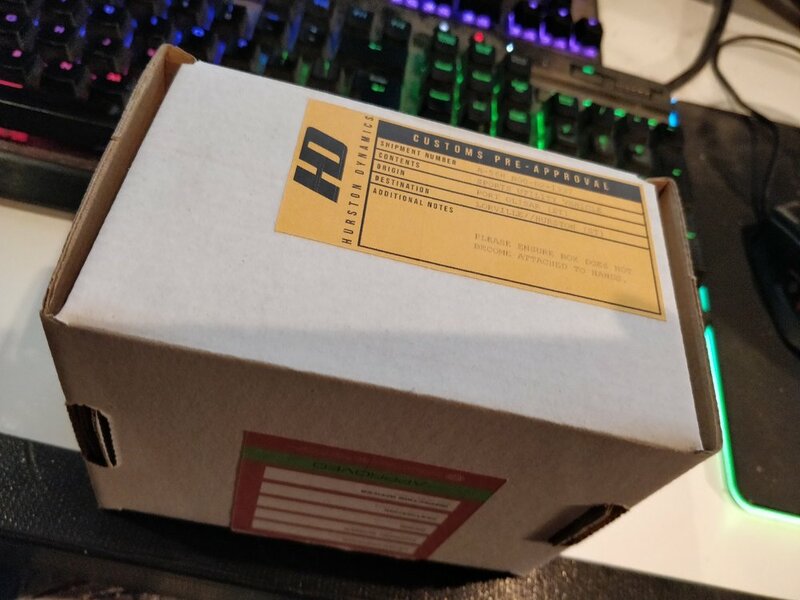 Our list had people from CIG offices across the globe (Austin, Frankfurt, LA and Wilmslow) so we knew the Greycats had to be packaged well to survive. You'll know from our previous projects a boring box or crate just wasnt going to cut it. Adam took to this final project with with gay abandon. All that was left was a numbered Certificate of Authencity; signed by Ben Curtis, Props Director at CIG and Kals Wilde, General Operations Director at JR Design & Fabrication. And they were ready to risk the postal system. Sidenote: All 18 travelled without issue and have now arrived safely at their final destinations. The reactions have been amazing. Feedback helps shape our projects and is a huge motivator. Don’t forget that you can leave a comment on this blog, alternatively you can message us on Twitter or message us directly via the form on our homepage. You can also sign up to our newsletter to be kept up to date of our latest promotions, limited quantity product runs and project updates.